Description: For many years, the story of the Windiate's disappearance was a mystery. It was thought to have gone down in Lake Michigan, since it was spotted there in a fall gale and was never seen again. More than 100 years later, the wreck was discovered deep in Lake Huron's waters. The ship is in nearly perfect condition with masts upright, cabin intact, and the yawl boat lying alongside the stern. The Windiate is now thought to have sunk because heavy seas covered the decks in ice causing it to settle slowly to the bottom of the lake. No signs of the eight crewmen have ever been found. 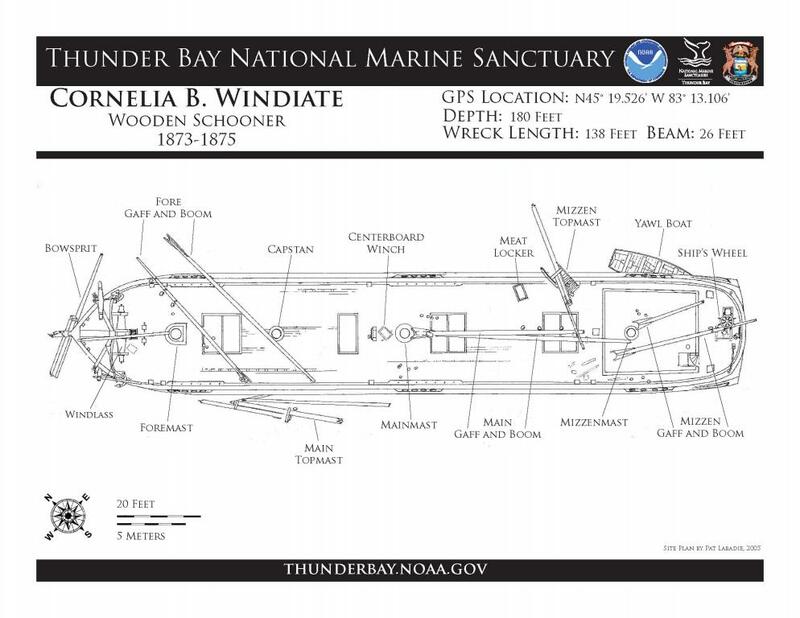 Cornelia B. Windiate site plan.